Lalandi No 4 - Long Beach Accommodation. Lalandi No 4 is a family furnished, Beach Front Self-catering 2 bedroom holiday Cottage for a relaxing break at the Namibian Coast. 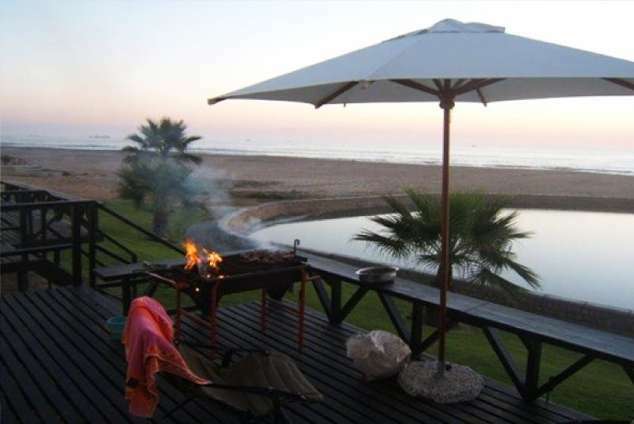 Experience the beach view from the sundeck while having a "braai", just laying in the sun or having tea with family and friends. You may experience a school of dolphins passing or even the occasional whale. A walk/drive to the long sandy beaches and the natural beauty of the sand dunes, right at your doorstep is also a great alternative for those more active. Langstrand is situated between Swakkopmund and Walvisbay, give or take 15km to both. Catch fish & crayfish, experience Surf and ski-boat fishing, do quad-biking & sand-boarding in the dunes, go on boat cruises, take on a camel-ride, practice your swing on the golf course, do a Scenic charter flight, take on para-gliding and even skydiving in and around Langstrand/Swakkopmund and Walvisbay. Just 2 minutes walk-away from the unit are 2 restaurants (Burning Shore & Long Beach Restaurant), tidal pools and play area for the kids as well! The cottage has 2 bedrooms with en-suite bath rooms (shower and bath respectively) and comfortably accommodates 4 persons. The kitchen/lounge/inside braai area is open-plan and the latter has a view of the ocean and goes out on the sundeck. The main bedroom also has an ocean view. The unit is fully furnished, bedding and crockery for 4 people. There is a laundry room complete with washing machine and tumble drier to ensure a restful break. The kitchen has a counter and is provided with an oven, microwave and dish washer. There is also an additional freezer for cooldrinks and ice. Deck chairs and umbrella is provided. The unit is fitted with DSTV. All bedding linen and towels are supplied with spare sets and washing and cleaning of the unit can be arranged on request. A cleaner is available to assist with laundry and cleaning but must be pre-booked. Whether you enjoy adventure, just want to put your feet up with a book or just take a break, Lalandi No 4 will provide you with a relaxing and comfortable environment to do just that. 12999 page views since 04 Aug, 2014.